New Mexico Gov. Michelle Lujan Grisham said on Tuesday that President Trump's "border fear-mongering" had misused National Guard troops in her state. The governor is seen here in a photo from Monday. The governor's order covers most of New Mexico's deployed troops, along with Guard members who have traveled from Arkansas, Kansas, Kentucky, New Hampshire, South Carolina and Wisconsin. In all, 118 National Guard troops have been deployed in New Mexico, the governor's office said. Lujan Grisham ordered the withdrawal just before Trump delivered his State of the Union address, in which he railed against illegal immigration and labeled a group of mainly Central American migrants as "illegal immigrants" — despite the fact that most of them are traveling with legal humanitarian visas. There had been speculation that Trump might use the State of the Union to declare a national emergency at the border, as a legal basis for going ahead with building his long-promised wall. The president did not mention that possibility during Tuesday night's speech. 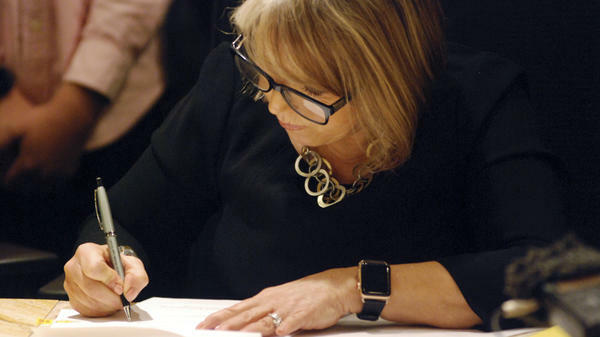 Lujan Grisham rejected the idea that a national emergency exists along her state's border with Mexico. But she also said some troops will remain in southwestern New Mexico, saying they're needed to fulfill a humanitarian mission in Hidalgo County and neighboring counties. Those counties "have seen large groups of families, women and children crossing over the border in the remote Antelope Wells area in recent months," the governor's office said. Hidalgo County and its neighbors are asking for help "as migrants and asylum-seekers continue to appear at their doorstep," Lujan Grisham said Tuesday. The state's National Guard will now decide whether a larger presence is needed to support those counties. In addition, the state police will send six officers to bolster operations in Hidalgo County — a move that the governor's office says was requested by the county manager. 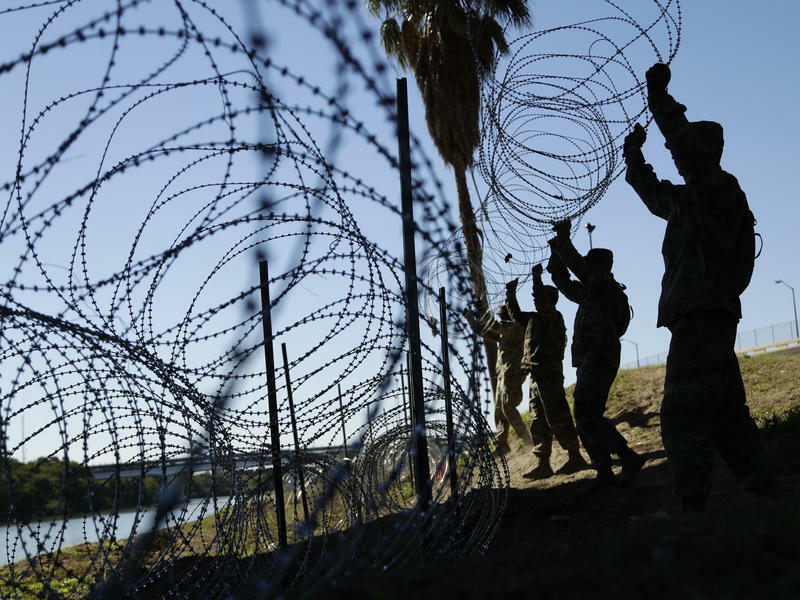 New Mexico sent National Guard troops to the border last April in an order from then-Gov. Susana Martinez that followed a White House proclamation. At least five states, including two led by Republicans, rejected the president's call to send troops, with Maryland's Gov. Larry Hogan saying his state wanted nothing to do with the Trump administration policy of separating families at the border. Trump began ordering Marines and other active-duty personnel to the border last fall. Earlier this week, he ordered an additional 3,750 troops to the Southern border, warning of "Caravans marching through Mexico and toward our Country." "As for the 'state of our Southern border,' mayors along the Southwest border consistently say that their communities are among the safest in the nation. McAllen, Texas, Mayor Jim Darling asserted that his city is the third safest in Texas, according to FBI crime statistics, and seventh safest in the nation. 'Send social workers to process the asylum-seekers, not soldiers,' Darling said in a recent call with reporters. Eddie Trevino, Cameron County judge in Brownsville, added, 'It is a misconception that the border is insecure. There is no Central American invasion. This is a manufactured crisis.' "